Love scotch eggs but hate all the extra fat that comes with frying them? 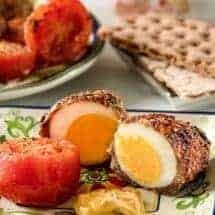 My Air Fried Scotch Eggs give you all the great flavor of traditional scotch eggs without all of extra grease and fat since they’re made in your Air Fryer. And did I mention my Air Fried Scotch Eggs recipe is low carb? 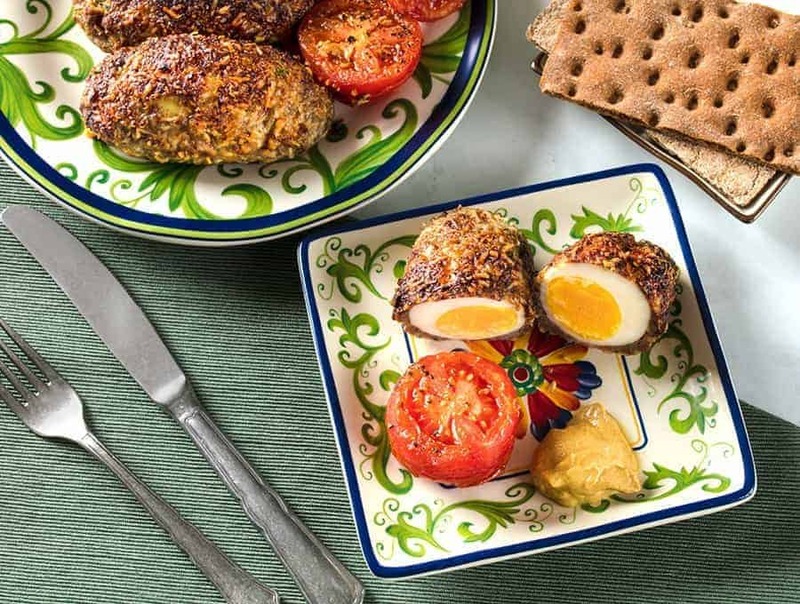 These scotch eggs are full of rich, savory goodness that will leave you wanting more. In the UK, Scotch eggs are usually eaten covered with a flour and egg wash and then coated with breadcrumbs. I wanted to make these Air Fried Scotch Eggs low carb, gluten-free and yet delicious, and I also wanted to reduce the number of ingredients needed. So I used parmesan cheese to coat the sausage and got a lovely, crunchy crust with very little effort. So what is a scotch egg, exactly? A scotch egg is an egg that has been hard-boiled, encased in sausage meat, rolled in some form of breading and then baked or fried. I don’t like to fry stuff at home. I can’t deal with all that leftover oil, the smell of the hot oil, and of course, I”m a klutz so there’s the danger of hot oil around me. These are great for picnics as well, since they travel so well. Some people like to keep the eggs runny. I don’t do so well with runny eggs, but if you prefer those, vastly underboil the eggs since they will cook more as they air fry. 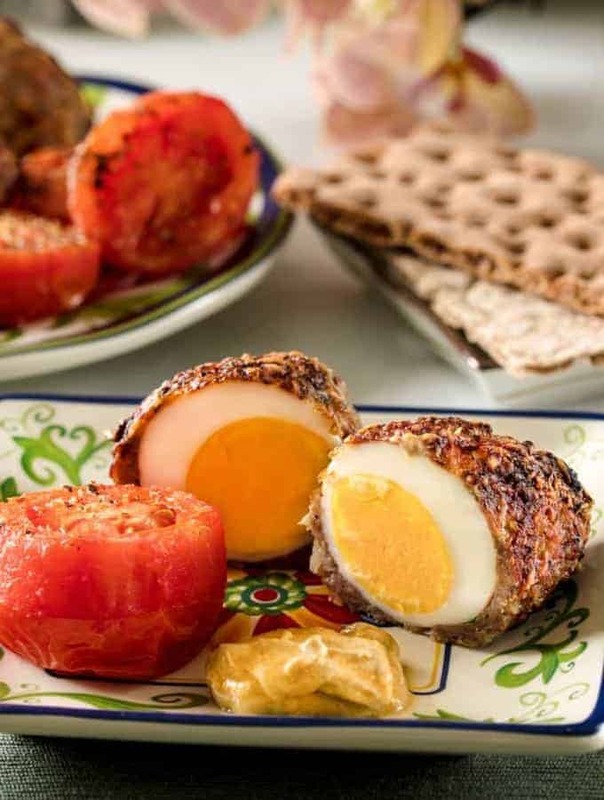 Typically you’d eat these AIr Fried Scotch Eggs with mustard, but honeslty they’re so flavorful, I’m not sure they need much of anything. 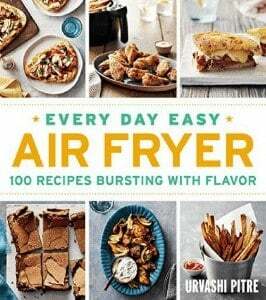 WANT TO TRY ANOTHER KETO AIR FRYER EGG RECIPE? CHECK OUT MY AIR FRYER HERB AND CHEESE FRITTATA! Love scotch eggs but don't want all the carbs and grease that come with them? 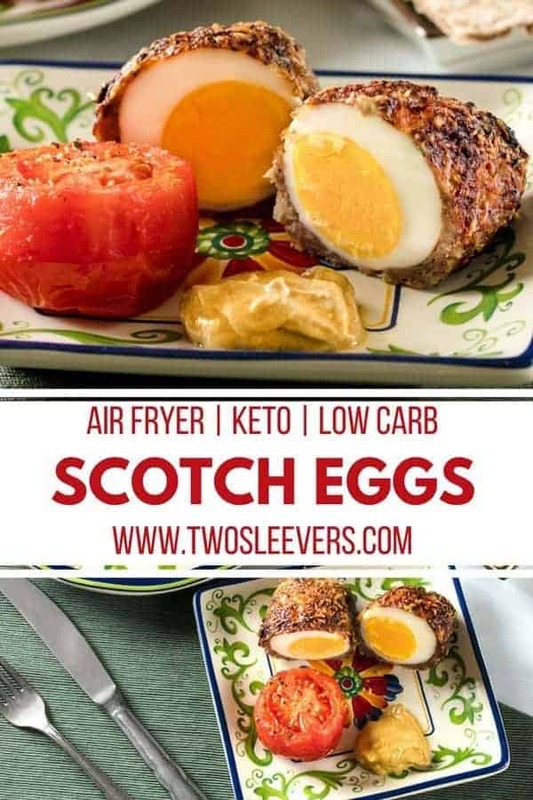 Try my delicious Keto Air Fried Scotch Eggs recipe! For the eggs: In a large bowl combine sausage, mustard, chives, parsley, nutmeg, salt, and black pepper. Gently mix until everything is well combined. Shape mixture into four equal-size patties. Please each egg on a sausage patty and shape sausage around egg. Dip each in shredded Parmesan cheese to cover completely, pressing lightly to adhere. Make sure the cheese shreds are well-pressed into the meat, so that they do not fly around in the air fryer. Arrange eggs in air fryer basket. Spray lightly with nonstick vegetable oil. Set fryer to 400°F for 15 minutes. Halfway through cook time, turn eggs and spray with vegetable oil. is there a recipe for the spicy pepper sauce? These were absolutely delicious! Easy to make, tasty and looked as good as they tasted! I make air fryer scotch eggs also. Here’s a tip, soft boil the eggs instead, then put in the fridge over night to chill. Prepare your breading then roll eggs gently in the mixture. Immediately put into the fryer while eggs are still chilled. Runny egg yokes, anyone??!!😀. Delicious!